A woman was killed by crocodiles after she jumped into their enclosure at a zoo in Bangkok. Wanpen Inyai, 65, apparently committed suicide by throwing herself into the midst of 1,000 crocodiles at Samutprakarn Crocodile Farm And Zoo. Inyai had reportedly not spoken to anyone in the period before her death. CCTV images showed her removing her shoes before she jumped into the water. Zookeepers were seen desperately trying to ward off the crocodiles in a bid to stop them from attacking the woman but their efforts failed. Police identified Inyai from her documents floating in the water. 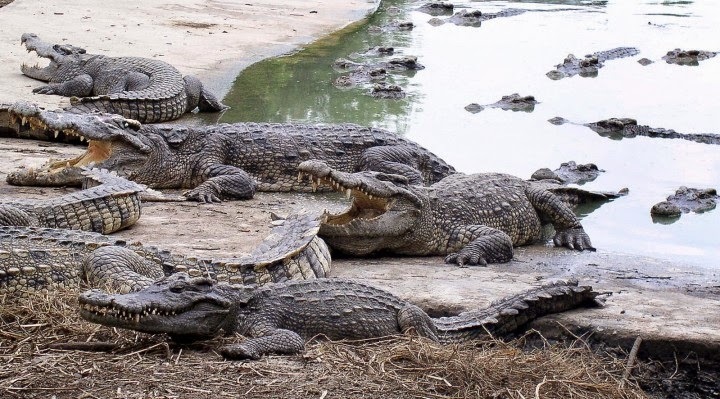 The farm has been open since 1950, according to its website, and is described as "the world's largest crocodile farm".